President Donald Trump has lashed out at America’s central bank as a stock market whose gains he once took credit for continued a historic plunge. In a tweet, Mr Trump said the Federal Reserve was “the only problem” of the American economy. Mr Trump’s treasury secretary meanwhile scrambled to calm investors. However, the Dow Jones fell more than 650 points on Monday, and is on track for its worst December since 1931 during the Great Depression. 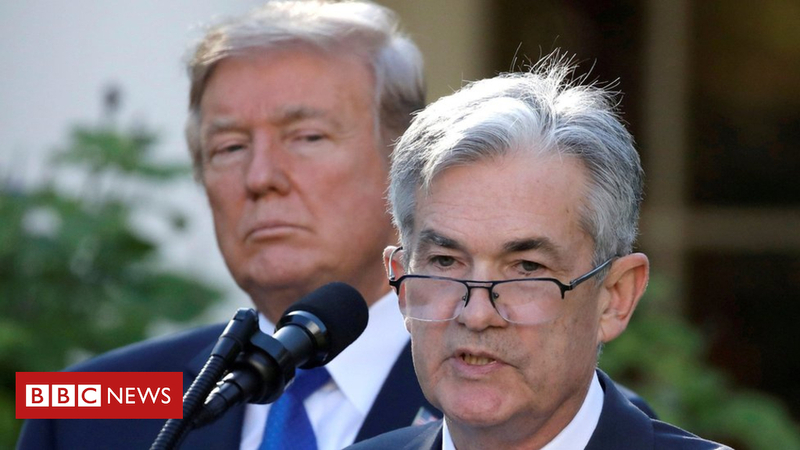 The turmoil comes amid a partial government shutdown, US-China trade tensions and reports the president has discussed firing Fed chairman Jerome Powell. On Monday, he called top market regulators and officials from the US central bank to allay fears about the economy. Mr Mnuchin hosted the call with the President’s Working Group on Financial Markets to “discuss co-ordination efforts to assure normal market operations”, according a treasury statement. The board of governors of the US Federal Reserve System, the Securities and Exchange Commission and the Commodities Futures Trading Commission are on the working group. So then President Trump weighed in by tweet and renewed his criticism of the Federal Reserve. That also did not have the desired effect. Instead of the typical Santa Rally, we saw US investors flee stocks for safety. Monday saw the worst day of Christmas Eve trading ever for US stocks. The Dow Jones Industrial Average dropped by 653 points, falling below 22,000. The S&P 500 entered so-called “bear market” territory. US investors are fretful about a range of factors including slowing economic growth at home and internationally, though US economic data is still strong. Mr Trump’s ongoing trade war with China as well as Defence Secretary Jim Mattis’s surprise resignation have also unsettled investors. What did US Treasury say? A Sunday statement from the treasury took the rare step of divulging details about Mr Mnuchin’s discussions with the top US banks. “The [bank’s chief executives] confirmed that they have ample liquidity available for lending to consumer, business markets, and all other market operations,” the statement said. Earlier, he dismissed reports that President Trump had discussed the possibility of firing the Federal Reserve chairman after the bank raised interest rates last week. Some financial pundits warned Mr Mnuchin’s intervention could backfire.